A perfect castle for children's party that fits many childhood and family themes! Medieval damsels, and castle guards set-up your Mighty Castle jump house rental for your Prince or Princess and their subjects to moonwalk, bounce and jump safely. 13 feet long, by 13 feet wide, by 16 feet tall. 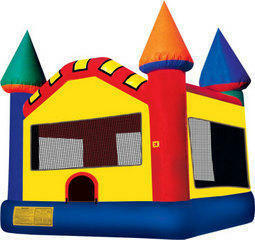 The Castle Bounce house rental will be delivered to your home or party/event location and be set up for you.